Wanze Eduards and Hugo Jabini successfully organized their communities against logging on their traditional lands, ultimately leading to a landmark ruling for indigenous and tribal peoples throughout the Americas to control resource exploitation in their territories. Suriname, located within the larger Amazon Basin, has opened up its immense tropical forests to extractive industries, all of which operate without local consent or oversight. In 2009, it was the only country in the Americas that did not recognize indigenous or tribal peoples’ rights to own and control their traditional territories. Indigenous and tribal peoples who live in Suriname’s tropical forests comprise approximately 20 percent of Suriname’s population of 450,000. The tribal peoples are Maroons, the descendants of African slaves who won their freedom and established autonomous communities in the rainforest between the late 17th and mid-19th centuries. The Saramaka are a specific group of Maroons that live in 9,000 square-kilometers of rainforest. In 1963, they lost almost 50 percent of their traditional territory to a hydroelectric dam built to power an Alcoa bauxite factory. Many Saramaka were displaced and remain in resettlement camps to this day. Others established new villages on the Upper Suriname River. In the late 1990s, the Surinamese government allowed logging companies to set up speculation projects and camps in the region, against Saramaka wishes. Further, extensive flooding caused by faulty creek bridging rendered a large area useless for traditional agricultural and other activities, thus depriving the Saramaka of an additional 10 percent of their territory. Wanze Eduards, a father of seven, is a traditional Saramaka leader who holds three offices: Captain, the head of his village of Pikin Slee; Head Captain, the highest official for 36 communities on a section of the Upper Suriname River; and fiscali, one of four members of the Gaama’s Council, the paramount official body in Saramaka society. Hugo Jabini, son of a female village leader and grandson of the former leader of Tutubuka village, is a Saramakan from Laduani village on the Upper Suriname River. Raised in Saramaka territory, he went on to study law at the University of Suriname. Eduards and Jabini first responded to complaints about the logging companies in late 1996 when villagers discovered that loggers had destroyed their subsistence farms in the forest. The Saramaka were told by the government of Suriname that they would be imprisoned if they tried to stop the loggers from working. Eduards and Jabini organized meetings with the communities most directly affected. Once they determined that the threat affected all Saramaka, including almost 70 villages on the Upper Suriname River comprising about 25,000 people, these meetings expanded to include all Saramaka communities. With the leadership of Eduards and Jabini, the communities established the Association of Saramaka Authorities (ASA) in order to better defend their lands and promote their rights. Jabini and Eduards led efforts to have Saramaka persons trained to make accurate maps to document their traditional territory and to demonstrate the impact of the logging concessions. After some 60 meetings in the various communities, the consensus was that the Saramaka could not obtain justice in Suriname and that they should seek the protection of the Inter-American human rights system. ASA filed a petition with the Inter-American Commission on Human Rights (IACHR) in October 2000. During and following the filing of the petition, Jabini and Eduards collected information that showed the impact on the Saramaka from logging and the threat of “irreparable harm” if the IACHR failed to act. They also continued to organize meetings in Saramaka territory to ensure that as many people as possible were aware of the developments with their case and were part of the decision-making process. In 2002 and again in 2004, the IACHR requested that Suriname suspend all logging concessions, mine exploration and other natural resource development activity on lands used and occupied by the Saramaka until the substantive claims raised in the case were investigated. It also requested that the Surinamese government take appropriate measures to protect the physical integrity of the Saramaka people. These interim measures, which were based on the evidence that Jabini and Eduards collected, were instrumental in halting these development projects. When the Suriname government failed to completely suspend the projects and comply with the other recommendations of the IACHR, the IACHR took the claim to the Inter-American Court, a legally binding body of which Suriname is a member. The judgment of the Court in Saramaka People v. Suriname not only provided the basis for the legal recognition and protection of Saramaka territory, with respect to land rights and prior informed consent, but also created a legal framework for the rights of all indigenous and tribal peoples in Suriname. Pursuant to the Court’s orders, this includes “their rights to manage, distribute, and effectively control such territory, in accordance with their customary laws and traditional collective land tenure system.” In January 2008, the Suriname government publicly declared that it would fully implement the judgment of the Court. The Saramaka ruling is also significant at an international level. In the ruling, which applies across the hemisphere, the Court held that resource exploitation concessions may only be granted in indigenous or tribal territories subject to four conditions: indigenous and tribal peoples’ effective participation must be secure; there must be reasonable benefit-sharing; there must be a prior environmental and social impact assessment; and states have a duty to implement adequate safeguards and mechanisms in order to ensure that these activities do not significantly affect the traditional lands and natural resources of indigenous and tribal peoples. Eduards and Jabini guaranteed territorial rights not just for the Saramaka, but all of the Maroons and indigenous people of Suriname. In addition, because the case was settled by the binding Inter-American Court, Eduards and Jabini changed international jurisprudence so that free, prior and informed consent will be required for major development projects throughout the Americas. They saved not only their communities’ 9,000 square-kilometers of forest, but strengthened the possibility of saving countless more. Wanze Eduards & Hugo Jabini, receiving their award at the 2009 Goldman Prize ceremony. 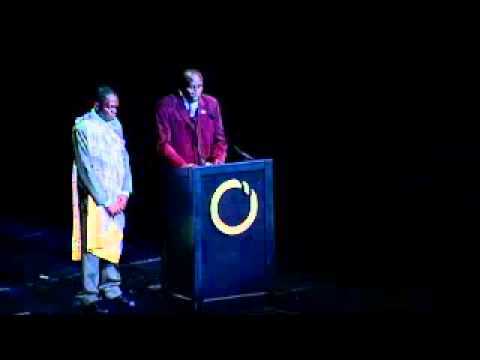 Wanze Eduards & Hugo Jabini, accepting their award at the 2009 Goldman Prize ceremony. 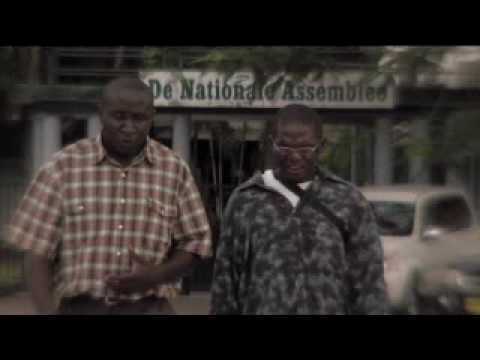 Wanze Eduards & Hugo Jabini, 2009 Goldman Prize winners for Suriname.